I meant to write a whole string of posts about some of the amazing female athletes at this year’s Olympics. For those who don’t know, the Summer 2012 Olympics marked the first time when all nations in the world would be represented, and even better it also showcased a lot of groundbreaking female athletes. I may be behind on the reporting but I still think these women deserve to be celebrated. 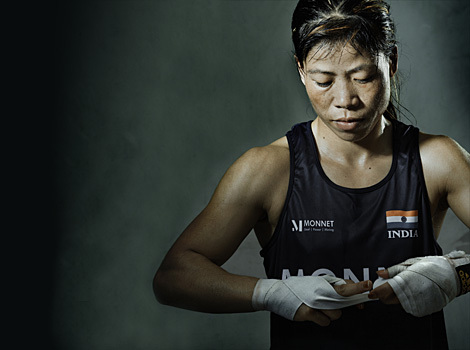 One of my favorite stories is that of Mary Kom—five-times world champion and mother of two—who has had to battle against far more than just her opponents in the ring. Mary Kom is an Indian boxer belonging to the Kom tribal community of north-eastern state of Manipur. She is a five-time World Boxing champion, and the only woman boxer to have won a medal in each one of the six world championships. She is the only Indian woman boxer to have qualified for the 2012 Summer Olympics, competing in the flyweight (51kg) category and winning the bronze medal. She has also been ranked as No. 4 AIBA World Women’s Ranking Flyweight category. In other words, she can probably hold her own in a dark alley late at night. Born in Manipur, Kom has lived there her entire life and is no stranger to poverty. The daughter of landless agricultural laborers, she moved to Imphal in her mid-teens to make something of herself in track and field. Then a Manipuri boxer called Dingko Singh won gold at the Asian Games in Bangkok. Dingko too was poor. When he came back he was received as a hero; on the streets people collected money to give to him. Mary heard that women’s boxing had just been introduced in Manipur. She approached the head coach at the Sports Authority of India centre, Ibomcha Singh. She would wait for him at the end of the day and when finally given a chance, won him over with her “do or die” approach in the ring. Despite her accomplishments, Mary continues to struggle to eke out a living for her and her family (her husband and two children). She lives in a house granted to her by the state built for the national games. To make a living she must rely on state awards (which don’t always reach her) and the salary from a sports-quota position with the Manipur police. Offered the designation of constable on winning her first world championship, she declined it. A few years later she accepted the post of sub-inspector, on a monthly salary of 8,500 rupees (roughly $160). Following two promotions and a landmark government pay-scale revision, she still only draws 31,000 rupees a month (roughly $565), a trifle in inflationary times. Since 2009, when she signed up with a talent management firm, Infinity Optimal Solutions, a few modest sponsorship deals have come her way. It’s pretty pitiful compared to the multimillion-rupee deals made with male athletes such as cricketers from India. Few Indians have ever seen Mary box, because barely any of her tournaments are televised or even streamed online. Her feats end up buried in the back pages, usually in the Sport in Brief. But when she returned from Qinhuangdao as the first and only Indian woman boxer to have qualified for the Olympics, the press was interested at last. Mary Kom violates the stereotype of the violating stereotype. This is her extraordinary achievement. Raw aggression, childbirth, nurturing, teaching, are all her province. She enjoys doing her nails and visiting the beauty parlour, loves raising her children, and yes, she will fight with a skirt on. These aren’t contradictions. She is not closing worlds, she is expanding them. I highly, highly recommend the More Intelligent Life article about Mary Kom. It’s how I first discovered her, and she epitomizes the ultimate woman for me. I hope to be a fraction of what she is someday. Loved your post! Love and care is key to everything, so true.